Put two tuning forks of the same pitch side by side. As you strike the first, you can notice that the second starts vibrating. In a relationship, each individual acts like a tuning fork that receives and transmits emotional waves. When one person has an emotional reaction, the “vibrations” affect the other– who starts vibrating in response. This response cycles back and either intensifies or dampens the first person’s emotion. If the two people are emotionally reactive, they will escalate their negative interactions into a frenzy. If one of them stays centered, she can start a dampening cycle even when the other person stays reactive. When you master your emotions, you can bring equanimity to any relationship. If you can stay grounded in the midst of an emotionally charged situation, you can help others stay conscious. On the other hand, unless you master the emotional skills I described in the previous posts, you cannot hope to help others. Each of the five competencies of self-mastery I listed here correlates to helping other people manage their emotions: recognition, acknowledgment, defusion, inquiry, and listening. Although you can’t observe the internal states of others, you can observe external signs. Emotions have a physical component (flushing cheeks) and a behavioral component (tightening fists). You can make valid inferences about the other’s feelings based upon these observable emotional clues (physical and behavioral), an understanding of the other’s situation; your attribution of values and objectives to the other, and your projection onto the other of the emotional dynamics you would experience in a similar situation (empathy). It is important to realize that what you infer the other thinks and feels is not what the other actually thinks and feels. You can’t read another’s mind. On the other hand, disregarding emotional signs is a great disadvantage. The skillful way to work with attributions (inferences about another person’s emotional and mental state) is to base them upon the best evidence available, state them tentatively (acknowledging that they are just your interpretation) and ask the other to verify them. To work with others’ emotions it is necessary to accept them without judgment. It’s not only useless to chastise somebody for what he or she feels, it’s also counterproductive. You might feel the urge to tell a troubled co-worker to cheer up, or tell your child that things are not really so bad, but such admonitions never work. The other not only continues to feel troubled, but now he feels alienated as well. A manager who notices that employees are scared about an upcoming organizational change might feel inclined to reassure them, “There’s nothing to be concerned about.” He may mean well, but his statement will most likely scare the employees even more. Challenging others’ emotions makes them feel judged, misunderstood, and disrespected. In extreme cases, it can make them doubt their sanity. Nothing defuses emotions like your own relaxed and centered stance. Simply not reacting exerts a dampening effect on intense emotions. Accepting the other’s emotion without judgment helps him recover his equanimity. Even in extreme circumstances it is possible to defuse the other’s emotions. Someone may be very upset with you, but you don’t have to escalate the conflict. You can take responsibility for the perception you triggered in the other and do your best to maintain equanimity. Through open inquiry, you can allow the other person to express his feelings and thoughts fully. When you understand the story behind the emotion you can take appropriate action to address it. And if the situation proves intractable, you can always separate in peace and with integrity. Without a reaction, an attack can’t last long. Like a fire that runs out of fuel, the emotional heat will consume itself. That’s why the best way to receive another’s emotion is with empathy, without judgment or argument. In order to defuse aggressive energy, look for ways to agree with the critic; don’t concern yourself with how incorrect you may believe his opinions are. Look for even the slightest grain of truth with which you can agree, so you can blend with the critical energy without sarcasm or defensiveness. Inquiry and Listening Inquiry aims to help others understand their emotions and act skillfully. The key is to help them present their needs and interests in a way that helps us see how to genuinely satisfy those needs and interests while also taking care of our own. Inquiry and listening are about influencing others, not manipulating them. The difference is respect for their autonomy, focusing on valid information and free choice. Manipulation is an underhanded attempt that, were it made public, would embarrass the manipulator and infuriate the manipulated. Manipulation is distorting information in order to lead the other to act the way you want, while believing that if he knew what you know he would not want to act that way. Asking someone open questions or requesting that he do something, on the other hand, is not manipulation. Our influence is overt, not covert. One way to make sure you are not manipulating the other is to use the golden rule: Would you like the other to inquire and listen to you in the way you are inquiring and listening to him? Here are a few questions you might use to help people understand their emotions and plan their responses. These questions are based on the emotional narratives I described here. Sadness. What are you sad about? What do you think you’ve lost? What leads you to believe that you lost it? What value did it have for you? How could you lessen or recover from the impact of its loss? How could you mourn what you lost in order to work through it and honor how important it was for you? Is there something else that you might need to do to feel at peace? Fear. What are you worried about (or afraid of)? What do you imagine might happen? What would you lose if that happened? What makes you think that this might happen, and that if it does it will harm you? How could you reduce the chances of it happening? How could you minimize the damage you would suffer in case it did happen? What else might you need to do to be at peace? Anger. What are you angry about? What hurt have you experienced? Who do you think caused it? What did he or she do? What boundaries did he or she transgress? What would reduce the damage or feel like reparation to you? How can you express your complaint? What else might you need to do to close the issue and be at peace? Under what conditions would you be willing to forgive? Guilt. What do you feel guilty about? What damage have you inflicted? Who have you hurt? What boundary did you transgress? Could you ask the damaged person about their loss? How could you minimize the damage and offer reparations? How could you express your apology? What else might you need to do to be at peace? Would you be willing to forgive yourself? Readers: Are there situations where you can recognize your rationality related to your emotions? Fred Kofman is Vice President at Linkedin. This post is part 11.7 of Linkedin’s Conscious Business Program. 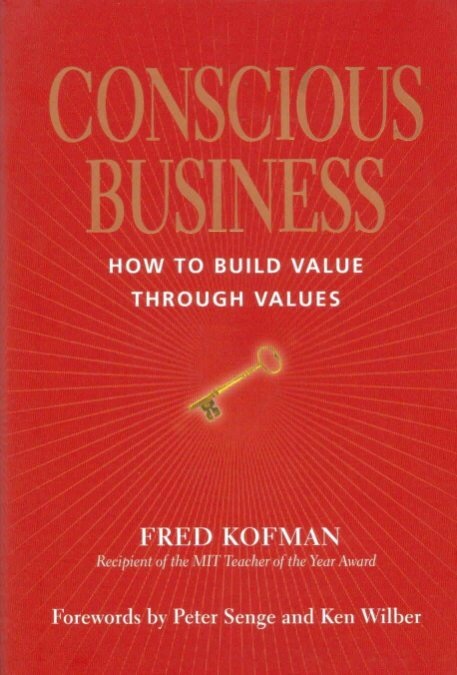 To find the introduction and full structure of this program visit Conscious Business Academy.